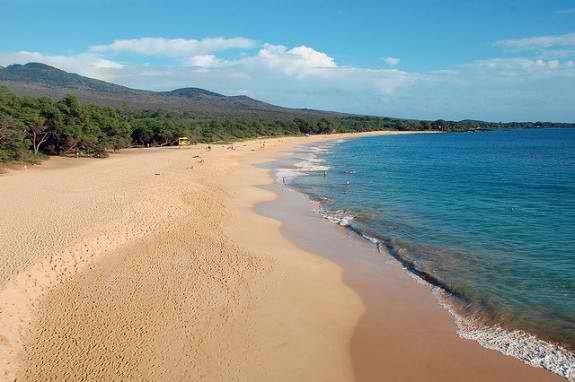 Hulopoe Beach Park is a breath-taking pocket beach at the head of Hulopoe Bay south of the remote and secluded vacation island of Lanai. The beach's grassy patch and pearl-white sand are ideal spots for picnics while the calm, crystal blue waters invite visitors for a refreshing dip. 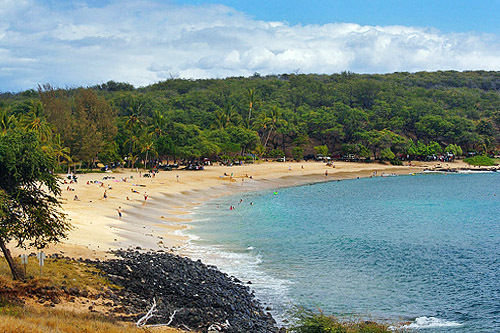 Despite the absence of lifeguards, the beach remains one of Lanai's safest swimming beaches for children. The shallow offshore reef and the large tide pools make Hulopoe a great snorkeling destination because of its rich marine biodiversity, which is attributed to the bay being a part of the Marine Life Conservation District. Fishing here is limited to hook and line from the shore. Visitors are also asked to leave stones and rocks in their places as well as not to take shells as souvenirs to help preserve the bay's marine life. Aside from the wide variety of colorful fishes and spectacular coral reef, the waters of Hulopoe Bay is also a favorite hang out for spinner dolphins. Signs in the beach requests swimmers not to touch or swim among the marine creatures. Humpback whales can also be seen during winter months. Beach park amenities include free parking, picnic tables, showers and toilets. Another popular landmark near the beach is the Puu Pehe or Sweetheart Rock. According to a local legend, a heartbroken warrior jumped from this 80-foot summit, rising from the sea, overcome with grief after his wife’s passing. 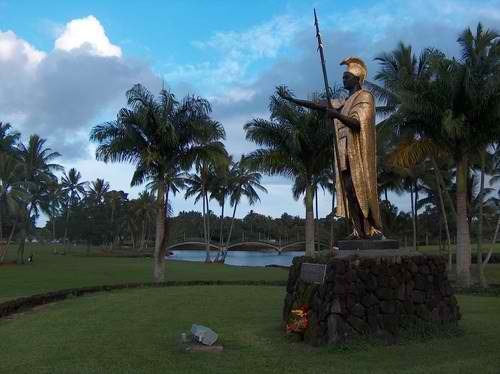 To get to Hulopoe Beach, take Highway 440 south to the bottom of the hill and turn right. The road dead-ends at the beach's parking lot. We are going to be camping the night of 3/11. Just two adults.